Hearing the dwarf trying to sneak by, the kobolds in the chamber quickly turned their attention to the party. Spilling out into the hall were to kobold sub-chiefs and 10 warriors, while a couple of she-kobolds and their whelps huddled in a corner. A melee quickly ensued. Ander stayed back firing arrows into the fray while Broak and Audrey cut the diminutive creatures down with Grabby weaving his way through the battle... foolishly finding himself separated from his allies with a swarm of kobolds between him and his friends. Realizing his folly (and getting seriously wounded) Grabby made haste and fell back to the smelter room in hopes of finding a hiding spot while his friends did the heavy lifting. He scampered into a pile of rubble: broken stone, an old work bench and a tapestry wold act as his cover. Unbeknownst to him his large, hairy halfling feet were sticking out obviously from cover. Two kobolds chased after him into the large chamber, one looked around for their quarry while the other immediately noticed the feet sticking out from beneath the tapestry. Driving his spear through the tapestry in hopes of striking the halfling cowering behind it, the kobold instead brought the rubble down on himself (oh natural 1 rolls), knocking him prone—and leaving Grabby very exposed. Back in the corridor the fight continued on, with Ander noticing another small group of kobolds come out from a chamber to the south. 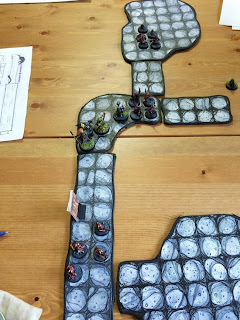 A kobold dressed in shabby robes and a larger, somewhat regal kobold (at least for a kobold) dashed further down the corridor away from the fight, while 2 sub-chiefs and 2 kobolds armed with insect filled clay jars tried to flank the party. As the fight ensued, the she-kobolds and their young escaped to the smelting room and up the stairs. The vermin-throwers hurled their insect-filled vessels at the part but missed continuously. At this point Ander sent his limping war dog Bloo down the south corridor to attack the kobolds defending their leader's escape. 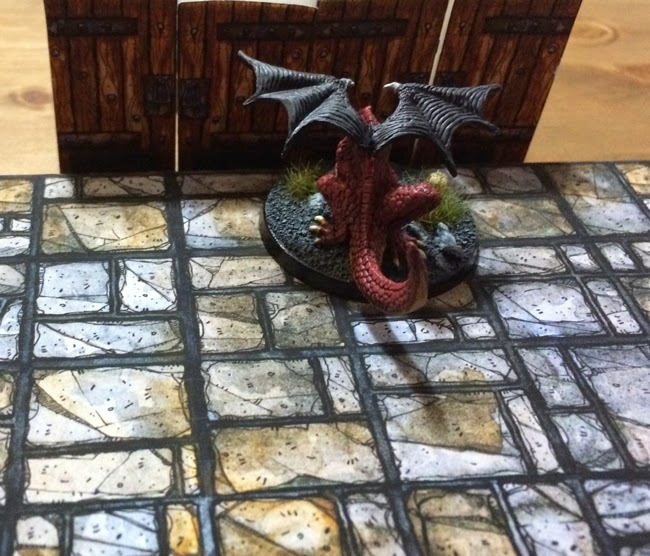 From behind a padlocked door in the west wall of the corridor, the sounds of several kobolds could be heard clawing at the door and screeching maniacally. They sounded "off" to the party—unnatural and almost feral. 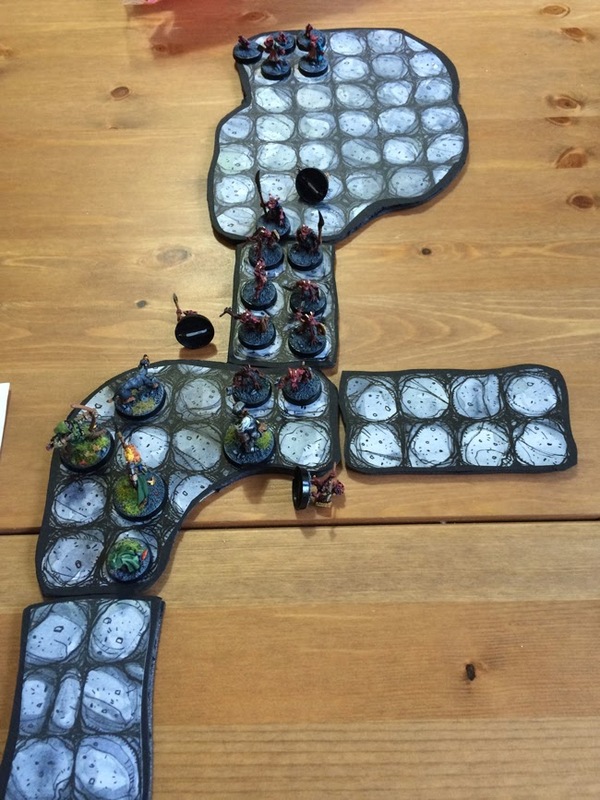 Moving on, they entered the chamber to the east where the kobolds ran from. It was a simple, make-shift throne room: a dwarvish chair adorned with metal and bones acted as a throne, and dirty animal pelts covered the floor. Finding nothing of value, the party moved further down the corridor, finding another room filled with candles mounted on dwarf skulls and filled with furs, dwarvish weapon racks and furniture, as well as a small chest acting as a dining table—the kobold chief's personal quarters. The party knocked the pewter ware off the chest and opened it up. Withing they found a pouch of shillings, small statues of dwarf warriors carved in a white stone, some potions, and a bundle of crossbow bolts. After further searching the room they found nothing and moved on to the south. Around the corner where the other kobolds had fled the cavern corridor quickly became narrow, fornicng the party to squeeze through sideways in single file through the dark, winding passage. Eventually they came out into a massive, dark chamber. They stood on a ledge jutting out over the open space close to 50 feet up. Around them they could make out strange structures of unknown design: the walls seemed to be carved from a strange grey-blue stone that was extremely smooth. High up the walls were small openings, presumably windows. This seemed to be an ancient, long-forgotten city built by unknown hands, now long abandoned and used by the kobolds. Further ahead in the inky blackness, down below the party, they could see the flicker of candle light coming from a chamber to the west, and the dim flicker of more light further ahead. Broak felt uneasy as his eyes adjusted to the darkness and began to recognize the stone work to be similar to the ruins where he and his troops had a fateful encounter with a beholder years before (see Broak's back story). Ander prepared a rope with his grappling hook and the party descended to the chamber floor. Once they were all down, Ander scouted up ahead past a chamber filled with candles, to a set of massive, iron double doors, one of which was open far enough for a person to slip through. On the floor nearby a large iron slat lay, broken off from the doors, obviously used to set in place to seal the doors. He glanced in quickly only to see stairs leading down a short way to shallow water. He returned to the party and relayed what he saw. The group then cautiously moved into the candle filled chamber, Broak becoming increasingly anxious. In this brightly lit room the floor was smeared with stained blood, and against the west wall was a relief carved into the stone wall: that of a great, five-headed dragon. They then pushed on to the opening of the iron doors and all peered in. They saw a massive chamber, filled a couple inches of water. Here and there piles of rubble jutted up, and a mist of sickly green-yellow mist sat on the water. A cool breeze with the smell of forest could be felt blowing down from high in the ceiling. Every wall of this vast chamber was filled with hundreds of kobold holes at various heights, many of which held lit candles. At the far end of the chamber was a raised square of stone with a large, ancient dried up fountain in the centre. Something had made its nest in the fountain: it was filled with various scraps and animal remains. In front of the fountain the glitter of loot could be seen, a loose pile of coins, gems and various items sat, unguarded. In the pile they saw the handle of what might be the object of their quest: the Forge Hammer. Broak refused to enter the chamber as memories of that fateful day flooded into his head: this was the chamber where his life changed forever. He glanced around an noted the bones of his fallen allies, still in the place where they had died. He warned the other that this may be the lair of a beholder. 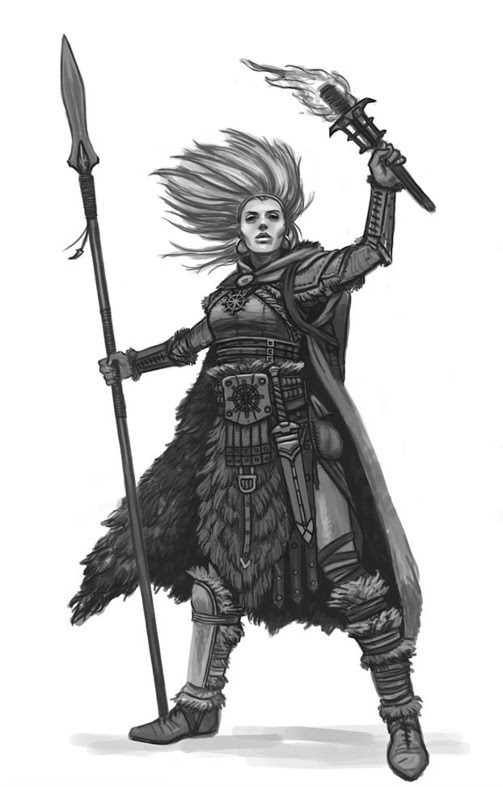 The party, now sufficiently paranoid by Broak's ramblings, devised a plan: Audrey would run to the loot pile, grab what might be the forge hammer, and rush back while Ander covered her, Broak sweated, and Grabby thought positive thoughts. Audrey secured her halberd to her pack, slid between the great doors, glanced around, then dashed through the flooded hall. 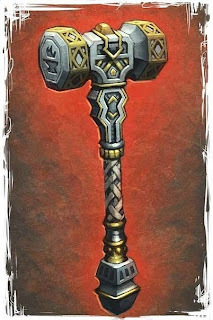 She quickly came to the loot pile and saw the handles of 2 dwarvish items sticking out so she grabbed them both: one appeared to be the Forge Hammer, the other a dwarvish warhammer. Moments after picking up the two items stones crumbled from high above. As Audrey glanced up the torn body of a man plummeted from the darkness above and crashed into the loot, scattering coins all about. Before her lay the body of one of Albrecht's guards (one of the thre that had accompanied Boots to the dungeon). His body was ripped open and great claw marks raked across his flesh. Audrey then heard an ominous hiss as a caustic yellow-green fluid dripped onto the pile of coins, melting the silver and fusing it to the stone floor. She looked up and saw the glint of two green eyes high up in the dark ceiling. Not wanting to wait to see what would happen, she turned and ran for the iron doors. As she raced back to her allies she saw a look of fear cross their faces as they watched a great shadowy shape rapidly descend from the ceiling. Just before hitting the nest a pair black, leathery wings snapped out from its form to ease its fall. 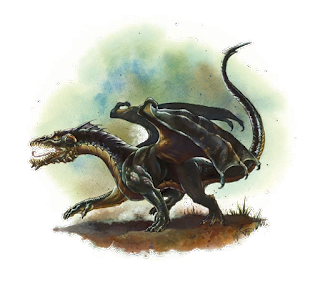 The dragon hit its nest, sending bones and debris scattering about and it let out a ferocious bellow, obviously displeased with the thief in its lair. Ander managed to hit the dragon with an arrow, but it simply shrugged off the wound and rushed after Audrey. Halfway back to the doors it raked its talons across Audrey's back leaving a terrible wound, but she managed to push on ahead and found herself leaping through the doors to narrowly avoid a second attack from the charging beast. As this happened Broak began closing the door and Grabby grabbed the iron slat to seal the doors. Now the dragon was trying to push the door open, and Ander leapt in to help Broak close the door. Audrey grabbed the slat from Grabby and slid it into place just as Broak and Ander narrowly got the door closed. A quick decision was made to flee back to the rope. 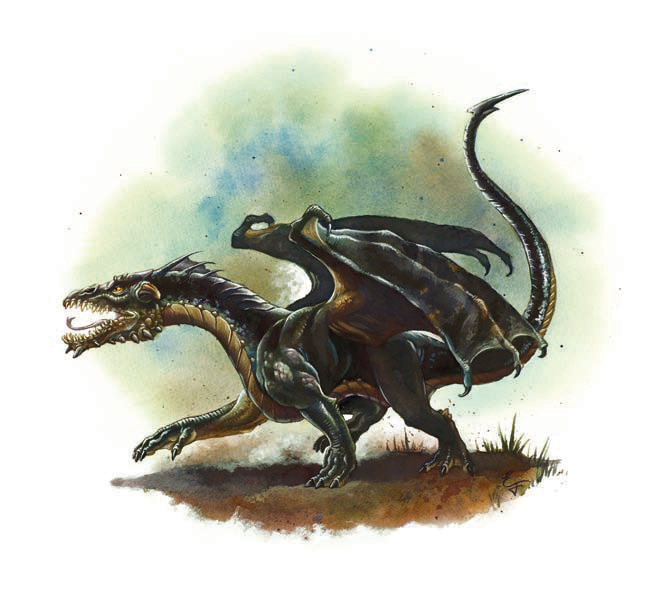 As they turned to run they could hear the sound of many—perhaps a small army—of kobolds yelping and screeching from the dragon's lair, presumably streaming out of all the kobold holes. Audrey quickly snatched up the Forge Hammer from the floor (she had dropped it and the dwarvish warhammer to help with the door) and Broak grabbed the warhammer. As Broak tightened his grip on the warhammer, it felt oddly familiar, then, just as he realized he was holding his old warhammer from that fateful encounter with the beholder, a flood of emotion swept over his mind. He suddenly saw flashes of his comrades being slaughtered as he stood by helpless, he fell to his knees screaming in horror, closed his eyes tightly to try and block out the images. As he opened his eyes again he experienced the killing blow he brought down on Dain's head all those years ago as if it were happening all over again. At this point the rest of the party had already dashed most of the distance back to the rope, turning around from Broak's scream to see the dwarf composing himself and run to catch up with the rest of them. One by one they ascended the rope, going as quickly as they could, while nervously glancing back at the iron doors. The doors shuddered from repeated blows and powerful blasts of the dragon's acid breath started to weaken the door. Once the last party member was up the rope they quickly began to navigate the narrow cave corridor, confident that the dragon was too large to squeeze through after them. Broak, the last one to enter the corridor, started to squeeze through just as he heard the iron doors falter and smash from the dragon's rage. They were safe... for now. Broak now carries his old warhammer, now infused with arcane energy brought on by the pain he suffered from his encounter with the beholder. 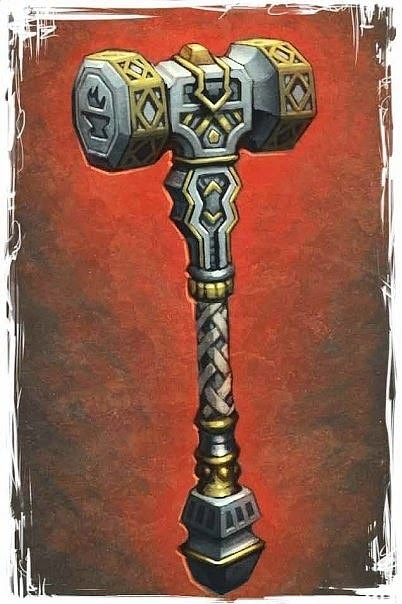 His hammer, Dwarven Despair, is a +1 warhammer. In addition, when he lands a critical hit with the hammer he deals an additional die of damage but must also make a Wisdom saving throw (DC 15) or be stunned for his next turn, as his critical hit forces him to experience the death of Dain again, as if was killing him again with that strike.